RLS is perhaps the most common condition you have never heard of, affecting more people than even type 2 diabetes. Up to 7-8% of the population has this neurological condition with 2–3% experiencing severe symptoms that affect their quality of life and require pharmaceutical treatment to manage their symptoms. You have a strong urge to move your legs (sometimes arms and trunk), usually accompanied or caused by uncomfortable and unpleasant sensations in the legs. Your symptoms begin or become worse when you are resting or inactive, such as when lying down or sitting. Your symptoms get better when you move, such as when you walk or stretch, at least as long as the activity continues. Your symptoms are worse in the evening or night than during the day, or only occur in the evening or nighttime hours. Your symptoms are not solely accounted for by another condition such as leg cramps, positional discomfort, leg swelling or arthritis. 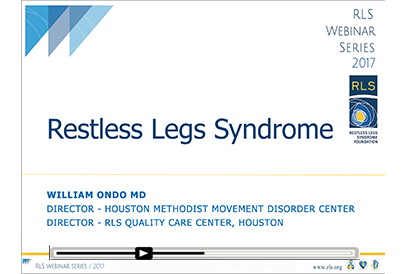 RLS often causes difficulty in falling or staying asleep, one of the chief complaints of the disease. Many people who have RLS also have periodic limb movements (PLMs) - jerking of the arms or legs that is often associated with sleep disruption. Remember, if you have RLS, you are not alone! Listen to a description of your symptoms and complete a diagnostic interview checking for symptoms listed under the essential criteria. 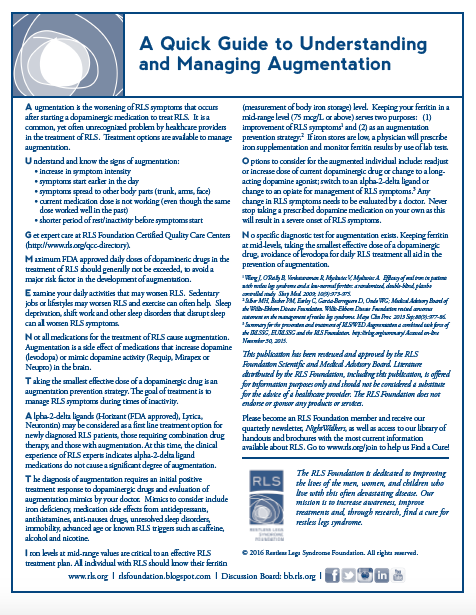 Rule out conditions that are often confused with RLS. Check your iron (ferritin) levels. Ask you to stay overnight in a sleep study lab to determine other causes of your sleep disruption. To better serve our members, the Foundation maintains a directory of healthcare providers who have experience and knowledge in the treatment of RLS. You can locate a provider in your area below. If you do not find a doctor in your area, try to broaden your search criteria or search by state. It is not necessary to enter a city to search. The RLS Symptom Diary is a convenient tool to record information on your daily symptoms such as when they occur, how long they last and possible triggers such as nicotine, alcohol or caffeine. Fill out your symptom diary before you go to bed each night and when you wake up each morning. The times you record in your symptom diary do not have be exact—just make a good guess. Reviewing your symptom diary with your bed partner can help you identify unknown symptoms or time frames. How can I use my RLS Symptom Diary? After about two weeks of recording in your symptom diary, you may find that some of your habits, such as drinking caffeinated beverages or exercising close to bedtime, may worsen your symptoms. 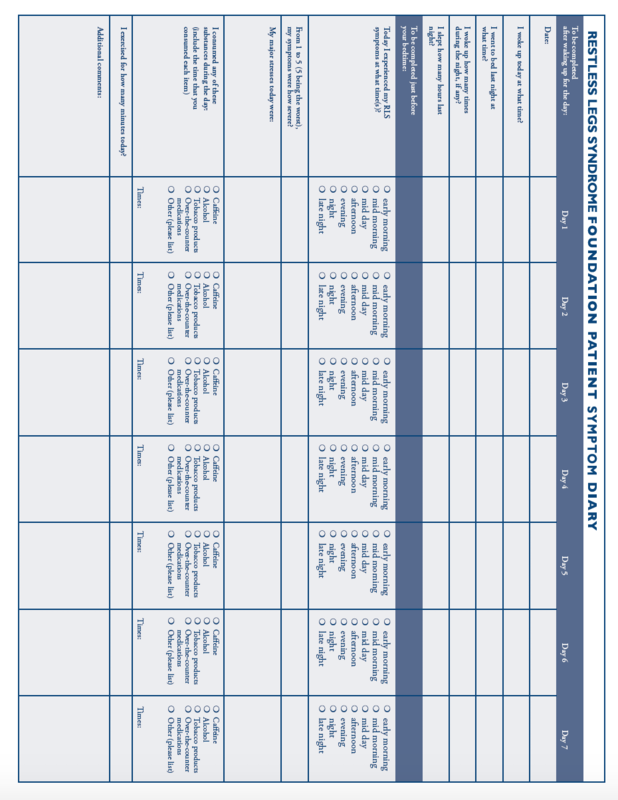 We have also developed a one-page symptom diary summary to share with your healthcare provider. Use it to record the main points from your symptom diary to summarize the information you collected each night. Some individuals who have RLS may experience a worsening of symptoms as a side effect of a class of RLS medications called dopamine agonists. This effect, called augmentation, is one of the most common but least understood problems encountered in the treatment of RLS. If augmentation occurs, you and your doctor can work together to find a new treatment strategy that will work for you. Be sure to talk with your doctor before making changes to your regimen. This guide offers an overview of RLS symptoms, treatment, coping methods and more. Keep a log of your daily symptoms to identify conditions and patterns, to share with your healthcare provider. Augmentation is the most common and least understood problem encountered with RLS treatment.